Polo players about to begin the game! Let me start by saying that The Ravi Report is officially a fan of polo and everything involved. The excitement of the game, the beautiful people, the hats and stylish picnics have all made The Ravi Report’s introduction to the classic game an impressive one. 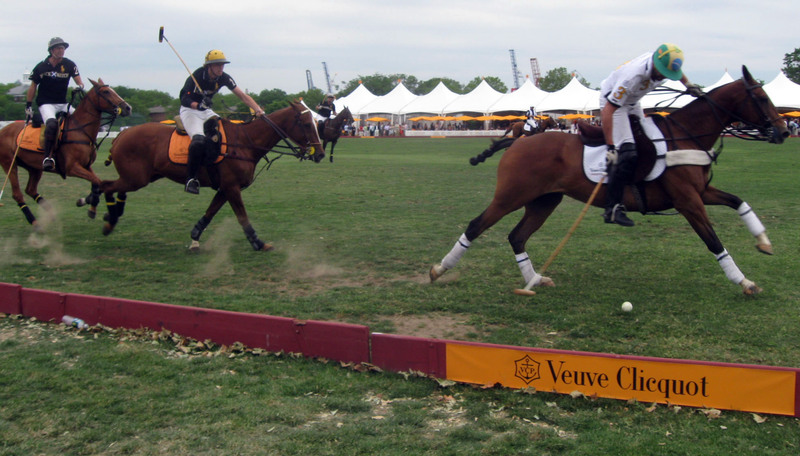 The Ravi Report was invited to the recent annual Veuve Clicquot Polo Classic NY Match party (and it was a LARGE party with over 10K people) at the Governor’s Island to watch one of the of most exciting pre-summer events in NY. The entire island was turned into what I like to call “Hamptons meet Manhattan” with spectators dressed in traditional polo attire topped with fancy and stylish hats complete with classic outfits and shoes portraying almost an aristocratic look. World famous polo player/model Nacho Figueras in action! “I saw more trendy hats here today then the Royal Wedding,” laughed one gorgeous blue-eyed brunette wearing a designer hat standing in line at the ferry that took the thousands of polo fans back and forth to Governor’s Island. But before I get into coverage of the celeb filled event (yes, Master of Ceremonies Hugh Jackman had a great time and co-host Marc Jacobs was ever so gracious to the press) I want to share some interesting facts about polo that I found very interesting. 1. 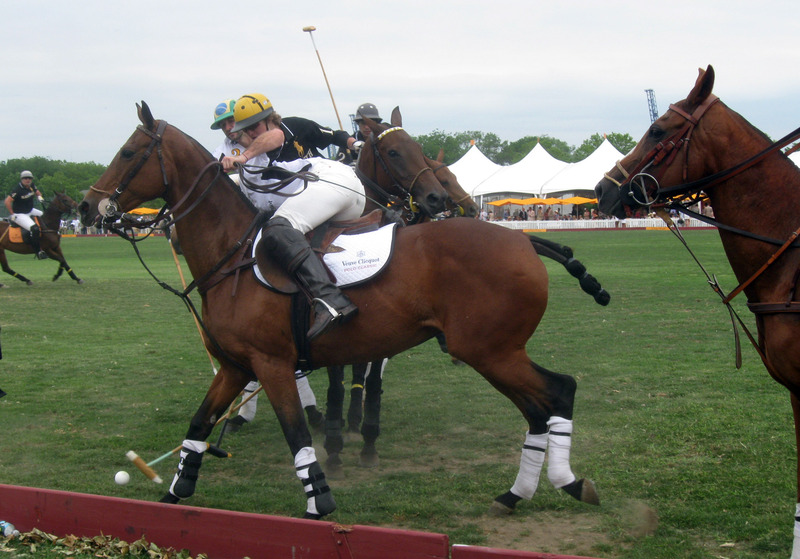 Polo originated in Persia and dates back to 5th Century BC. 2. Both women and men play although popularity is focused on the mens teams. 3. 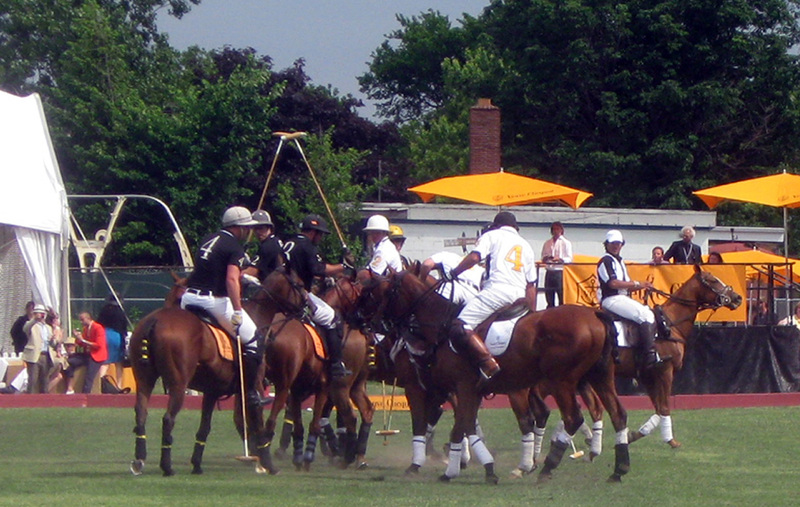 Modern game of polo is derived from Manipur, India. 4. Object of game is to get the wooden ball into the opposing team’s goal using a long-handled mallet. 5. Players change horses during a break period due to the intensity and speed of the game. 6. Played in 16 countries but not yet termed an Olympic sport. 7. Players cannot play left-handed. Now for the coverage. The annual VC Match was indeed something not to be missed. The long lines (the lines to get on the ferry to and from Governor’s Island was well over an hr long and stretched well over 10 blocks long) the crowds (over 10K according to one NYC cop) and the drama (one stunning hottie with long legs kept yelling at her boyfriend about the long wait) and the die-hard fans (one gorgeous Brazilian girl with sultry red lips traveled over 4 hours to see the match) was all worth it. The polo game brought out the best of the best from the entertainment world including celebs Hugh Jackman, Donna Karan, Vanessa Kay, the president of Veuve Clicquot USA, Delfina Blaquier, the wife of the polo star Ignacio Figueras, Deborra-Lee Furness (wife of Jackman), the super talented Wyclef Jean, comedian Kathy Griffin and of course the most famous polo player (and Ralph Lauren super male model) Nacho Figueras, Captain of the Black Watch team, who pretty much had the crowd mesmerized when he entered the polo field. The Ravi Report was keeping score! The field was laced with a sea of alluring, stylish, champagne drinking (which sold out in minutes) spectators who embraced the warm weather while enjoying the game looking glamorous while anxiously waiting for their hero Nacho Figueras to come into the field. The intensity of the game was felt every second! “I waited two hours on-line just to see Nacho play,” said one striking red-head sporting a white Ralph Lauren dress in honor of the loved Figueras, who also happens to be the face of Ralph Lauren’s entire mens fragrance line. When the superstar made his entrance, the crowd went crazy with excitement and you could hear the ladies panting in the middle of clapping. It was quite the scene folks. A little bit about the acclaimed polo player if I may. 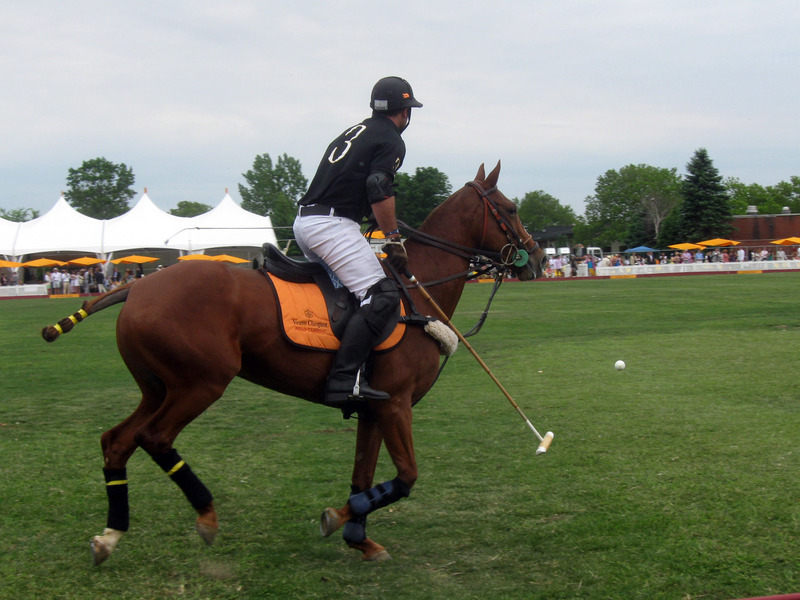 Figueras was born in Buenos Aires and started playing polo at the age of 8 and turning pro at 17. He then became a professional athlete in Argentina and soon globally famous when he signed on in 2000 to be the face of Ralph Lauren Polo fragrance. 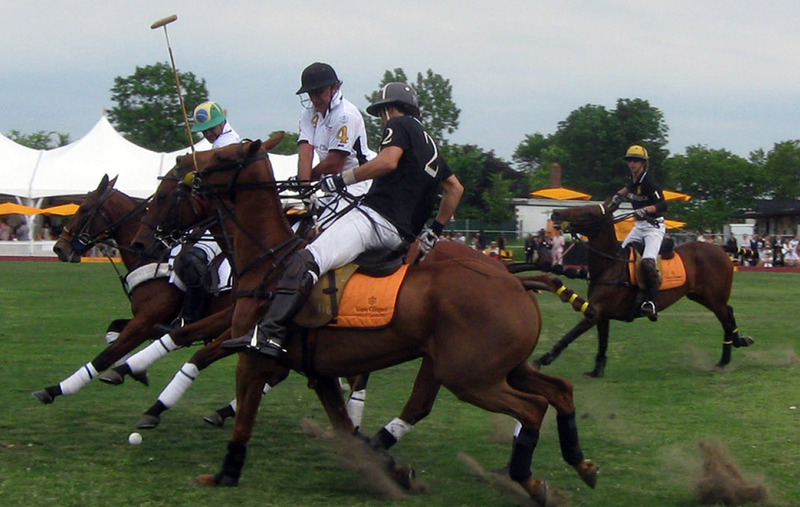 Since then, Figueras has used his celebrity status to bring awareness to the game of polo in the US by co-hosting and participating in celebrity matches around the country. Figueras 37, is married to model Delfina Blaquier and they have three children. For most of the spectators, it was a day filled with culture, elegance and a chance to see one of the most popular polo players in the world do what he does best- captivate an audience with his gift of playing polo. So next year folks, make sure you don’t miss one of the most exciting polo games ever to happen in NY and start hat shopping now! The journey continues…and in style.